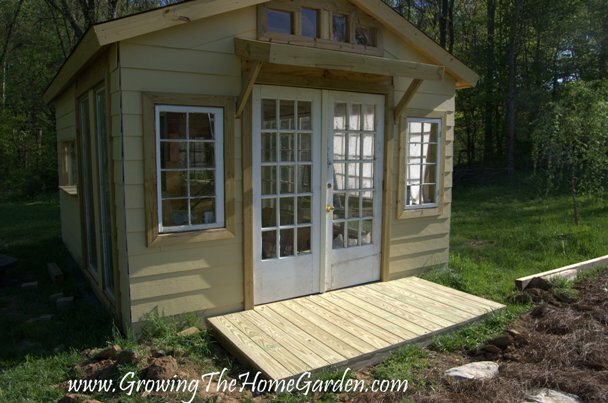 Last weekend I put together a small front porch for my garden shed. It's nothing fancy - just a small platform measuring 8'x4' made from pressure treated lumber. 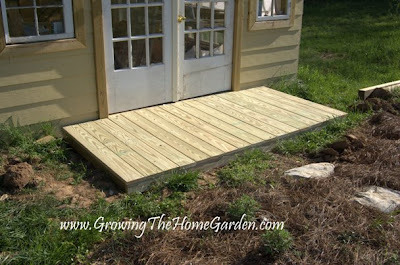 It's wide enough to fit a couple chairs when needed and provides a platform for entering the garden shed. The deck is free floating and can be moved if needed. It isn't attached to the building but appears like it is. It has corner posts and a center joist at 24 inches. There's still a lot more to do but with warm weather and gardening in full swing it's been hard to find the time to tinker on the garden shed. The next course of business is completing the two missing pieces of siding. Then I'll tackle the corner trim and begin the long tedious process of caulking and sealing the gaps. Inside there's all kinds of stuff that needs done. Last week the temperatures got up over 100 degrees inside the garden shed. I ended up covering one of the big windows with a large sheet which lowered the temperatures about 8-10 degrees. I'm waiting for the leaves to fill out on the trees to see how much additional shading I'll need to add. It's been very hot lately hasn't it? Yes, the weather's getting hot. Your garden shed looks very nice from outside. I'm sure it also looks good inside. And you're clever to put that front porch without attaching it to the building. Good work! 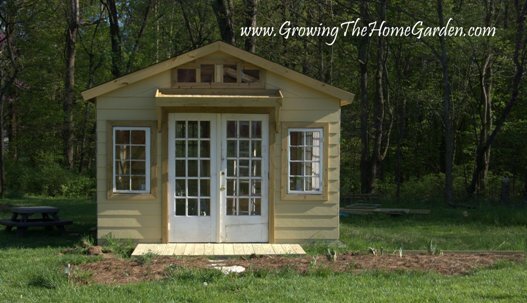 This shed is looking great. It definitely looks good. Making such a garden can definitely be a big factor for the upcoming season.